I know that I am not alone in my love of podcasts. 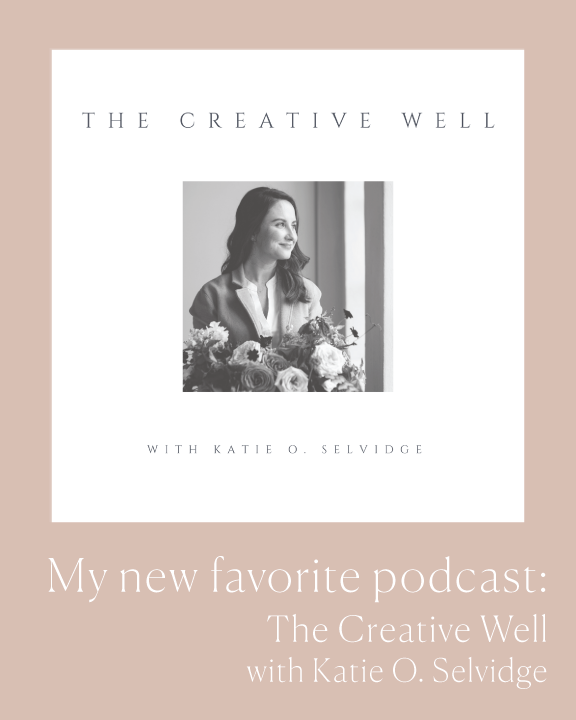 Today I wanted to share with you a new podcast that has already become a favorite of mine, The Creative Well with Katie O. Selvidge. Many of you may know or at least know of Katie Selvidge. Katie is the founding editor of Cottage Hill, where she has created a beautiful community in which meaningful stories are artfully told both visually and through the written word. She has cultivated a brand whose goal is to help her readers and her students “create a life more beautiful than their brand”. See how good she is with words! Over the years, Katie and I have had numerous conversations about business, being a creative entrepreneur, life, motherhood, and the beautiful challenge of navigating it all. So when she first told me that she was planning to start a podcast, I was so excited. I knew that it would be a favorite because of her wealth of knowledge, wisdom and how she is always able to beautifully communicate real, applicable truths with grace. She is honest, but understanding and she quickly gets to the heart of an issue in such a way that it becomes clear how to implement the strategies and points that she discusses. Learn Katie’s four-step process for pricing herself well for any speaking engagement. Kelly Mendenhall shares three ways to implement 'effective' intention into your work & business. Learn how to stay sharp and inspired during seasons of change like a sabbatical or maternity leave. Ciarra Rouwhorst shares her wisdom on how to overcome imposter syndrome and find your self-worth. Clearly already such a great list of topics. I am sure that you will enjoy them as much as I have. I truly cannot speak highly enough of Katie, and I think that anyone else who has the privilege to know her would feel the same way. And just as a hint, Katie may of may not be involved in a special way in the upcoming workshop this March! Interested in learning more about the upcoming in-person workshop this spring? Join the waiting list to be the first to find out about details and have early access to tickets.